International cooperation and capacity-building – There was a proposal initiated by Comoros on behalf of African States to have a separate objective (Objective 23) on international cooperation to have clearer understanding and goals to achieve and fulfill international cooperation. This was supported by other Member States but is still to be deliberated. You may refer to the statement attached in this email. Concept of firewalls – There was a lot of back and forth on including the term “firewall” in the GCM. It was understood that it will not be used but the principles and concept of firewalls will be retained. 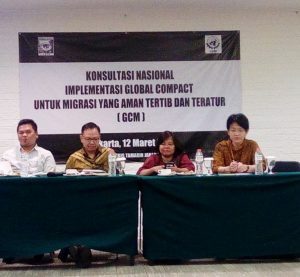 Integration/contributions of irregular migrants – Co-facilitators wanted to Member States to share how irregular migrants have been integrated in their country. Member States have acknowledged the contributions of all migrants and are being integrated in the socio-cultural aspect. Effective and efficient cooperation on return – Member States have expressed that return should be voluntary and that forced return should be used as a last resort. Relatively, there were not much contestations on objectives 17-22. However, Some Member States have been consistent to differentiate regular migrants from irregular. Brazil, on behalf of 16 Member States including Bangladesh, Nepal, Philippines from Asia, have shared their general comments on the thematic issues mentioned above. The like-minded group has also presented a statement reaffirming their commitment in the process and open to the possibility of having a middle ground on the issues and the GCM itself. You may refer to the statements attached in this email. A notable debate was on United Arab Emirates proposing new language on Objective 6 sub-para. (h) on recruitment. This was supported by Austria on behalf of 27 EU states, Australia, and Singapore. However, Philippines proposed to refer back to the language used in the Zero Draft, and was supported by Indonesia, Nepal, and El Salvador. In terms of implementation, capacity building, follow-up and review, Brazil has expressed concern on the role of IOM in the GCM given how IOM is currently in an election process for the Director General of IOM, which may alter the structure, role, and purpose of IOM, including the role it will play on GCM. It was suggested it might be best to discuss this further in the next round of negotiations. With this, a new draft has been released which is attached in this circular for your reference. It would be good to, again, look at the developments from the previous drafts on how language and some concepts may have been changed, deleted, weakened, and/or strengthened. You are also welcome to provide and/or suggest possible alternative language which you can forward directly (gcmigration@un.org) or to us, MFA Secretariat. The June negotiations will be held on 4 – 8 June 2018. It will go through the draft rev 2 objective-by-objective. There will also be two informal dialogues with stakeholders on 5 and 8 June. More information can be found on the letter of the co-facilitators attached in the email. On 3 June (Sunday, New York time), there will be a civil society strategy meeting in New York and part of the meeting will be looking at implementation, follow-up and review. We are encouraging you to share with us your insights, feedback, suggestions, and recommendations on this via email (mfa@mfasia.org). You may also do this during the Webinar this week. 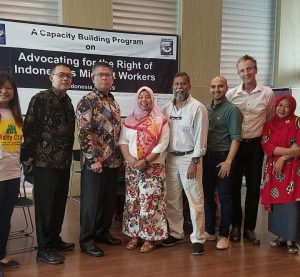 The Webinar will be held on Thursday, 31 May 5PM Manila time to discuss the May Negotiations and strategize in time for the 3 June civil society strategy meeting, and June negotiations. All documents related to this circular can be downloaded below. Thank you very much.